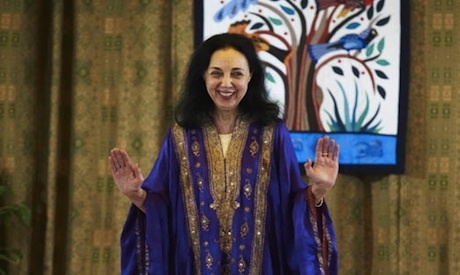 For two hours, without any intermission, Egyptian storyteller and researcher Samira Kirollos, Ph.D. in Drama from Stanford University, told the stories of her favourite ancient Egyptians: Akhnaton, Hatshepsut, and Cleopatra, bringing each character's distinct personality to life. 'They Did It Their Way,' was an evening of storytelling set to Sinatra music, held at the EU Delegation to Egypt on the evening of 8 June. Kirollos portrayed the three rulers as a tribute to the January 25 revolution. The leaders are inspirations for the storyteller, and had helped to revolutionise and develop Egypt for more than 5,000 years ago. For some, the idea of a solo performer portraying multiple characters failed to impress. Others seemed to appreciate Kirollos’ meticulous research and high ideals. “I first focussed on Akhnaton, Hatshepsut, and Cleopatra when seeking the ideal figures that I wished to bring to life. Research skills obtained from years of study that culminated in my Ph.D. in Drama, coupled with time spent with the experts who set me straight on aspects of my readings went into writing of the scripts,” she told Ahram Online. Kirollos’ storytelling methods are revolutionary. “By playing Frank Sinatra before each story, by wearing costumes that suggest rather than demonstrate historical accuracy, I link the past to the present as we deal with, at times, elusive Pharaohs that we strive to understand,” said Kirollos. Kirollos studied ballet from an early age. Before telling any stories, she opened by dancing along to the legendary Frank Sinatra’s ‘I Did It My Way.’ As the music faded out, she took on her first character, Akhnaton. “The touching, single-minded Pharaoh Akhnaton created a revolution in religious thought and ancient Egyptian art,” said Kirollos. Decked in jewelry and a yellow, ancient Egyptian costume, Kirollos engaged with the audience as King Akhnaton. In character, she described his background, historical facts and some of his most interesting achievements. For the audience, the Cleopatra story may have been the most familiar, but as Kirollos launched into the events of the queen’s life, obscure details emerged. There were mixed reactions to 'They Did It Their Way' as the audience filed out of the hall. Some were pleased with the performance. Others were extremely bored and glad the two-hour show had ended. Some commented that Kirollos was a better stage performer and actor than she was a storyteller. Some had left the room before she even began her Cleopatra story. 'They Did It Their Way,’ with all its historical facts, was indeed enlightening and inspirational for Egypt today, but in all its excitement may have failed to engage the audience. I saw the show last night and thought it was wonderful. Unfortunately, you forgot to give credit to Professor Barry Kemp, Dr Kathleen Martinez and Dr Zbigniew Szafranski, who participated in the post-show discussion, and were also part of the event. They are doing an essential job in protecting Egypt’s pharaonic heritage. Those of the audience who walked out before the Cleopatra performance had prior engagements and the organizers were aware of this. I can only say, judging by the level of applause at the end of the show and people’s comments afterwards, the great majority were enthralled with Samira Kirollos’s storytelling performance. Ultimately, a very difficult task of bringing three pharaohs’ back to life was handled with extraordinary skill.